Here are my reactions to the article featured on the Sunday Times of Malta on the 29th of July relating to pesticide residues. Let’s be absolutely clear, in an ideal situation we would have 0 (zero) samples resulting in excessive residues. In writing these observations, I am in no way defending the fraction of irresponsible local farmers who are caught abusing of synthetic chemicals. The EFSA report mentioned in the article is about food available in Malta and not just about locally produced food. The samples taken from Malta also included imported produce. 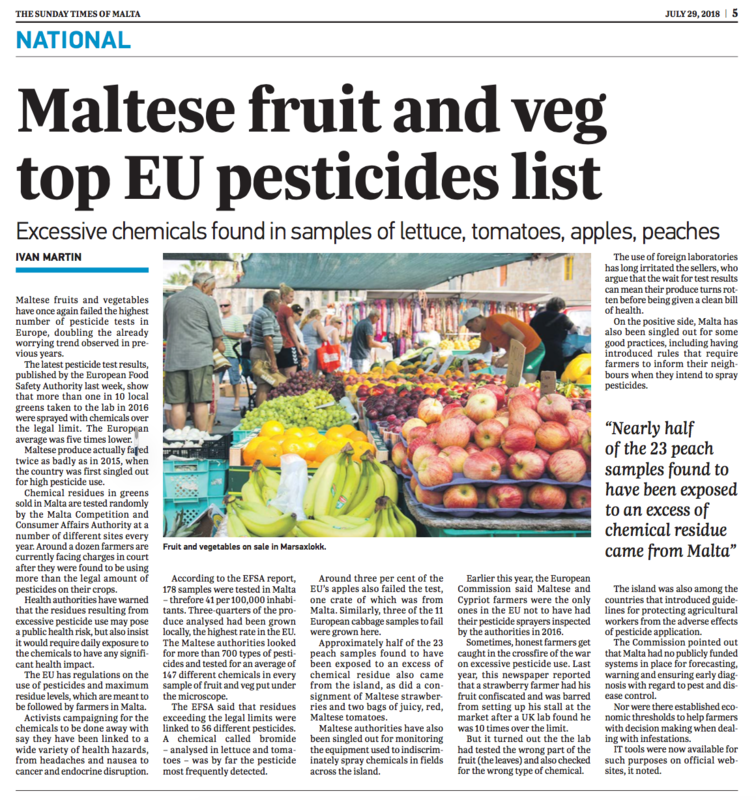 The title on page 5 of the Sunday Times of 29.7.18 was “Maltese fruit and veg top EU pesticides list“. Unless stated otherwise, one (or more likely… all readers) would easily presume that the word ‘Maltese’ is referring to fruit grown in Malta. The article projects the findings as though all the samples were taken from locally produced food. It would have made quite a big difference if it said something like ‘fruits and vegetables available in Malta’, rather than ‘Maltese produce’! Lettuce is mentioned in the subtitle as one of the products from which consumers should steer away. This is totally inaccurate. Out of the 15 lettuce samples tested (all of domestic origin), one was found to be with pesticide residue, and even so, the concentration resulted to be lower than the Maximum Residue Limit (MRL). Mr. Martin has craftily projected the findings in a wrong way, and not just in this instance… sensational much? It has long been acknowledged by different stakeholders, and very recently tackled in the National Agricultural Policy for the Maltese Islands 2018 – 2028, that lack of traceability is a huge threat for Maltese agriculture. Sources within the industry frequently report that green vegetables crates used at the Pitkalija (the local) market are also intentionally being used to carry foreign produce. In light of such blatant mislabelling leading to agro-alimentary fraud at a local level, how can one fully rely on such statistics as the ones presented from the national authorities? There could have easily been samples labelled as local for the purpose of this study, when in reality the contents would have been imported and sold as local. In Malta we consume more imported products than those locally produced. The percentage of imported food being consumed is way higher than that locally produced. So how come are we testing more the domestic product (73.6%) rather than the imported ones (26.4%)? In order to safeguard consumers, a better ratio needs to be tested thus reflecting the share of imports vs local (and by local, I mean Maltese and not Sicilian… you’d be amazed to learn as to how broad of a definition is bestowed upon the term ‘local’). Quoting data from a report may be considered as factual communication, but interpreting, or presenting it, in such a way so as to make Malta’s position look even worse is nothing less than deceitful. In the report this is in relation to the whole EU study, but in the Times of Malta it was printed right after mentioning Malta, leading readers in thinking that the said chemical has been found on Maltese products. By the way, this chemical, utilised as methyl bromide (a chemical used to clear soils from fungal pests) has been banned from Malta for at least a decade. The same can be said for “The EFSA said that residues exceeding the legal limits were linked to 56 different pesticides.” Again, this is not specific to the Maltese results. But of course, it makes for much more interesting reading, if that tiny detail were to be omitted. It fails to mention that Malta opted to have the broadest analytical scope in all of the EU. 721 out of a total of 791 (in the previous year Malta tested for 147 pesticides, thus making a leap in 2016 of nearly 500%). The fact that Malta is carrying out tests on a wider range of chemicals when compared to our EU counterparts goes to show that very little room for foul play is being left. There are also more chances to be caught red-handed. Also, more tests per capita are being carried out when compared to most other EU countries. For instance, in Portugal 4 samples were taken for every 100,000 inhabitants, while Italy tested for 18 samples per 100K inhabitants. Malta tested 41 samples per 100K inhabitants. This definitely increases the chances of detecting faults, and that’s how it should be! But certainly not all countries are being as strict in their controls. On a milder note: Even though Mr. Martin let himself go with a little poetic license, I would have omitted the term “microscope” on such a scientifically oriented article. The chemicals in question are only detectable using highly specific equipment such as a GC/MS, certainly not merely a microscope. But anyway, let us not waste our time on trivial details. 60% of cereals samples tested (all of which were of imported origin) have presented pesticide residues… many people are led to think that fruits and veg are the only source of residues that can enter our bodies. Cereals are our staple food. Quite alarming… but Times of Malta opted not to report on this! Mr. Peter Agius, who currently holds the position of Head of the European Parliament representation in Malta, took the issues brought forward in this article very seriously. Following the publication, he raised his concerns on social media namely the popular platform “Dilettanti tal-agrikoltura, sigar u pjanti”. Apparently Mr. Ivan Martin, the person reporting for Times of Malta, got wind of this and had the cheek to reply that he will be investigating the matter further. As a professional journalist, he should have investigated facts thoroughly before publishing the umpteenth defaming article and not after any type of social media uproar! Thanks to him and other journalists producing half baked articles about agriculture, Maltese farmers are losing their jobs due to consumers’ lack of trust. And as usual, when we eventually lose more agricultural land in Malta, we would have lost much more than just our local products. This report, amongst others, is an eye-opener. Irrespective of sensational articles, the real local scenario is as yet unknown, at best unclear, and much more needs to be done by all stakeholders. Authorities must wake up. MCCAA and the Department of Agriculture have been completely silent. It shows lack of interest and proactiveness towards the agricultural sector. No wonder many Maltese farmers have lost faith in authorities! There is a very limited support structure to tackle incoming pests from abroad as well as lack of training in the field of Integrated Pest Management. Education is definitely one of the sector’s immediate needs. Relevant authorities need to have their priorities reassessed. Farmers are losing their jobs and Malta is losing its agricultural landscape leading to more cranes and concrete blocks. During the past 24 hours I have repeatedly checked the Facebook fan pages and other social media platforms of respective authorities and so far, not even a one-liner has been published to acknowledge the article, let alone project any reactions… Basta għandna l-Imnarja! One final thought… If this is about 2016, we are now two years down the line. Rapid actions need to be taken on a much shorter scale in order to ensure healthy and residue-free food on our Maltese shelves. As from 2015, MCCAA increased the range of pesticides being tested (analytical scope) by almost 500%. Can authorities tell us if the situation has improved or worsened? How can agricultural experts advice farmers to react with better agricultural practices to avoid pesticides when such data is already 2 years old?! Thanks for exposing what is either incompetent or malicious journalism by Mr Ivan Martin on The Times.